Thanks to a dramatic comeback, the Nashville Predators are on the verge of their fourth straight trip to the playoffs. The Predators can earn a postseason berth on Thursday night when they host the St. Louis Blues in the finale of a home-and-home series. Nashville (40-31-9) rallied from an early three-goal deficit on Tuesday to beat St. Louis 4-3 in overtime. The victory moved the Predators into eighth place in the Western Conference, one point ahead of Vancouver for the final playoff berth. The Predators can clinch a postseason berth Thursday if they beat the Blues in regulation and the Canucks, who host Edmonton, fail to earn a point. 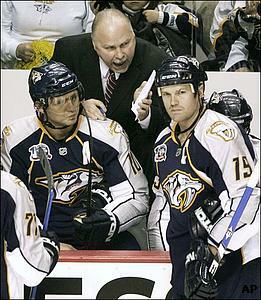 Nashville has reached the playoffs in each of the last three seasons, but failed to advance past the first round each time. "This is a tremendous two points," said Rich Peverley, who scored the game-winner on Tuesday. "We can't afford to lose any of these games. We need to get two points as many times as we can. "It was a big character builder because we knew we could come back and win. We have to carry that into the next game." The Predators gave up three goals in the first 6:46 of the game. Coach Barry Trotz then replaced goalie Dan Ellis with Chris Mason and Nashville held St. Louis to just 10 shots from that point on. Brandon Bochenski and Jordin Tootoo scored and combined with Peverley on a fourth line that totaled six points. "After they got the third goal, we sort of said, 'That's it. We can't let them have any more. We've just have to chip away. We've got to get out of this period,'" Trotz said. "The boys really battled. We just rolled four lines." Ellis had been 3-0-1 with a 0.48 goals-against average in his previous four starts. Now, the Predators will be trying to wrap up the sweep against a Blues team they've dominated recently. Since the start of 2005-06, Nashville is 19-3-1 against St. Louis (31-35-13), including 10-0-1 at home.The lone defeat in Nashville over that span was a 3-2 shootout loss on Nov. 17. Nashville has won the last four meetings by a combined 17-9 score after going 0-2-1 in the first three matchups this season. Mason is 3-2-1 with a 2.37 GAA in six games against the Blues in 2007-08. "It's kind of the way that the second half of our season has gone," St. Louis coach Andy Murray said Tuesday after his team dropped to 3-14-4 in its last 21 games. "The first 41 games, we close that game out with a win. We don't give up any chances, we continue to pressure and forecheck and play hard. The first thing we said when they came in after the first was outwork a hard-working team." Andy McDonald, David Perron and Jamal Mayers scored for the Blues, who own the second-worst record in the Western Conference. Manny Legace stopped all eight shots he faced in the opening period, but suffered a hip flexor injury and was replaced by Hannu Toivonen at the beginning of the second.